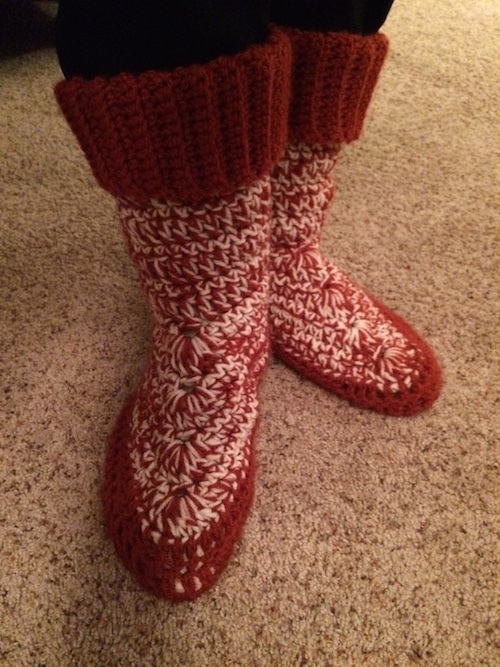 I found a free pattern online for these boots. I didn’t have the yarn they recommended on hand, so I pulled what I did have out of my stash and experimented. I used a Redheart in a off white color and the red is I Love This Yarn brand. I had to reduce the number of starting chains for the boot a bit because my yarn was heavier than the one they recommended, making my chain too long. 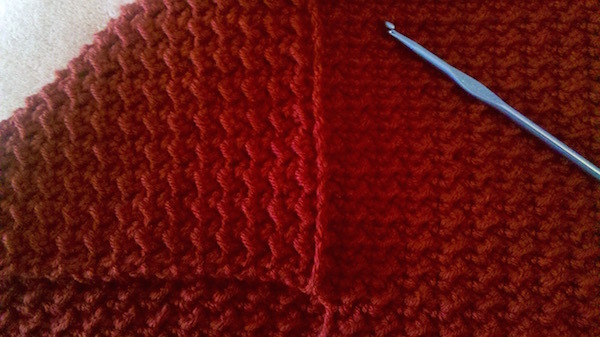 That meant adjusting the pattern all the way through but the extra work was worth it. I love how they turned out. They keep my toes snug and I can wear them into bed if I want, unlike my house slippers which are just too stiff and shoe-like to sleep in. And in red and white they remind me of peppermints and Christmas. 🙂 Feeling kinda festive in my latest crochet project! What is your latest project? Share and inspire us! It took far longer than I expected, but I have finished the Raised Diamonds Cinched Tote Pattern. I could’ve thrown it online last March, but I wanted to test the pattern to be sure it was accurate and to make the tote in another yarn to see how it translated. I am loving how these totes function! The drawstring makes it so easy to grab and go because it is self-closing. No zipping or snapping. And it opens up to a nice wide circular opening, making it easy to see inside your purse and get to the items you want in there. 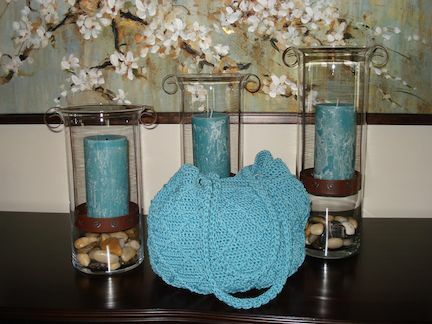 The pattern is available now on Etsy, Craftsy, Ravelry, and my website for $4.99. 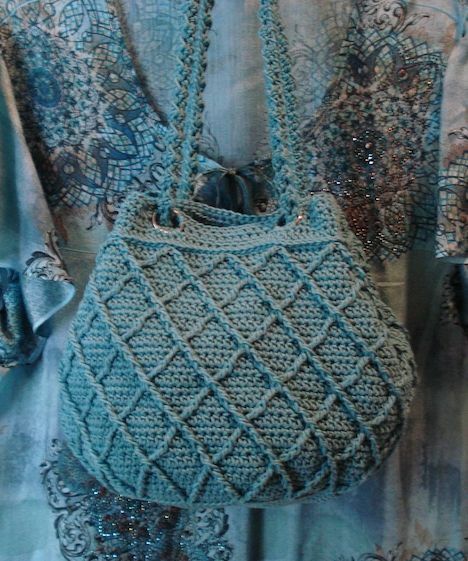 This was my original bag made from Sinfonia in “Teal”. Sinfonia is mercerized cotton so it doesn’t pill or fray. It’s also washable making it a good choice for a handbag that will get a lot of use. Sinfonia comes in dozens of colors online so you can get it to match just about any outfit or to suit anyone’s taste, from traditional to wild! Here it is again with one of my favorite blouses. I decided to make the next one from Omega La Espiga size 18 nylon cord. This stuff is sturdy (think fishing nets) and is one of my favorite choices for purses. Getting used to crocheting with a stiffer cord like this takes some time. But once you adapt, you will love the results! And Omega La Espiga comes in over 80 colors. 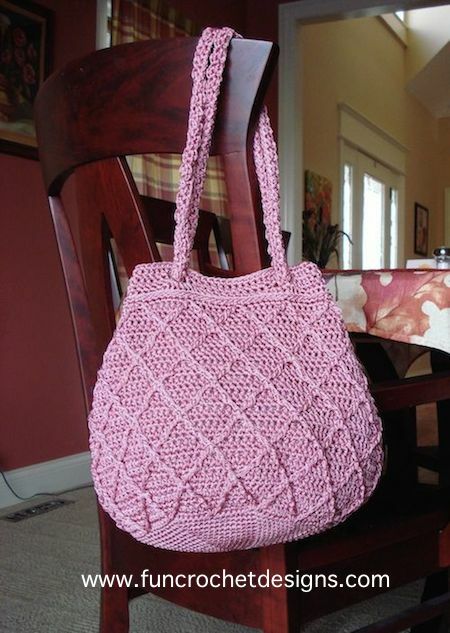 Here is the Raised Diamonds Cinched Tote Pattern in Rose colored nylon cord.